The 1st Battalion The Border Regiment was in Malta when war threatened to break out in South Africa. At short notice they were embarked to strengthen the meagre garrison. They arrived in Cape Town as war was declared, and rushed to Natal to join the force which was to be commanded by Sir Redvers Buller to relieve Ladysmith. This was to prove yet another war where the British soldier was to suffer because of incompetence. For The Border Regiment it came early. On December 15th 1899, they attacked at Colenso with the object of crossing the River Tugela. No proper reconnaissance had been carried out. The attack proved that the river could not be crossed in daylight under fire, and heavy casualties were suffered before the retreat was ordered. After much fighting in the hills by the River Tugela, the force at last broke through and Ladysmith was relieved on 28th February 1900. For the first time, the Volunteer and Militia soldiers were formed into companies to serve overseas, where they joined their Regular Battalions in South Africa. They arrived in time to take part in the difficult and tedious guerrilla war which lasted until finally, the peace was signed in 1902. After South Africa, it was inevitable that the Army should go through another series of reforms to drag it into the 20th Century. The Volunteer Battalions were formed into the Territorial Force, available, if necessary, to fight overseas. The Volunteer Battalions now became the 4th and 5th Territorial Force Battalions of the Regiments, and the Militia Battalions became Special Reserve Battalions to reinforce the Regular Army. Thus the structure was laid on which to build the huge Army of 1914-1918. It was the Regular Army which bore the brunt of the early attacks by the Germans in 1914. The 2nd Bn The Border Regiment joined the hastily formed 7th Division which embarked for Zeebrugge in October 1914, its objectives being to save the Channel Ports. The Germans poured troops against the small British Army near Ypres, but the 7th Division, in spite of appalling casualties, held on. Here the Regiment won its first Victoria Cross of the war, when Private Smith VC and Private Acton VC helped to get the wounded under cover. The other Regular Battalion 1 Border, were in India and Burma on the outbreak of War, Territorials were sent out to relieve them of Garrison Duty. The 1/4th Border relieved 1 Border in Burma. On arrival home, these “Indian” Battalions were formed into elite long service Regular Divisions. 1 Border joined the “Incomparable” 29th Division. In April 1915, it landed with the Division at Cape Helles, Gallipoli. By now the whole country had responded to the call. In all the Regiment had 13 Battalions who saw Active Service including the 11th Border Regiment or Lonsdale Battalion as they where more commonly known , and one Battalion which saw service on the North West Frontier of India Battalions from the Regiment served in almost every theatre of war; France and Flanders, Italy, Mesopotamia, Gallipoli and Macedonia. Many Battle Honours were awarded to the Regiment. 5 Victoria Crosses were won by men of the two Battalions. 1st Battalion Captain (A/Lt. Col.) James Forbes-RobertsonVC, DSO and Bar, MC , Sergeant Edward John Mott VC, Sergeant Charles Edward SpackmanVC 2nd Battalion Private James Smith VC and Private Abraham ActonVC. The First World War cost the Regiment nearly 7,000 lives. Between the wars the Regulars returned to policing the Empire. In 1919, it was the Irish “Troubles” that drew Regiments to Ireland and 2 Border were involved until the Army left Southern Ireland in 1922. 1 Border were sent to India and were soon on the North West Frontier in 1922/23 in the Razmak Operations. In 1927, by an unusual coincidence, both 1 and 2 Border met in Shanghai where the Nationalist Chinese were threatening the International Settlement. 2 Border served on the North West Frontier of India in 1931/32, and 1 Border in Palestine during the Arab Revolt in 1938/39. In April 1940,42 (East Lancashire) Division TA, joined the B.E.F., and 1 Border joined 5 Border in this Division. Both Battalions were heavily engaged in the German Blitzkrieg of May 1940, which ended in the successful evacuation from Dunkirk. 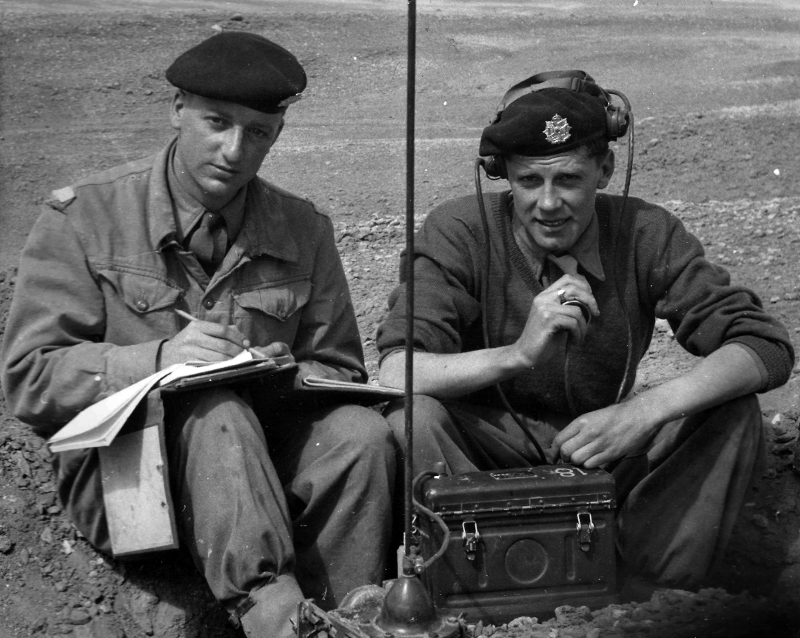 The 4th Battalion The Border Regiment had been guarding the Lines of Communications in France since November 1939, but they, inevitably, became heavily engaged in the German onslaught. On 23 May they were in action near Amiens. In June they were fighting on the flank of the 51st Highland Division, where D Company held the enemy at bay at Inchville for six days until they were all either killed or captured. Most of the remainder of the Battalion escaped to England through Brest. During 1940, many re-organisations took place. The 5th Battalion Border Regiment were converted to Royal Armoured Corps Regiments. 1 Border were converted into Airborne troops transported by gliders, and joined 1st Airborne Division. The Regiment wears a glider on the sleeves of their uniforms, an honour granted to the first troops to go into action by glider. This was the Sicily Landings in 1943. The Battalion also fought in Italy and gained immortal fame at the Battle of Arnhem 1944. 4 Border also served in Syria, fighting the Vichy French from Syria, now part of 70 Division, they were taken by sea to take over the besieged Garrison of Torbruk from the Australians. On the night 3rd/4th December 1941, the Division broke out and eventually joined up with the advancing 8th Army. 4 Border were then sent to the Far East and took part in the Chindit operations. 4 Border walked into the Jungle. They operated in the Naga Hills behind the Japanese lines. Meanwhile, two other Border Battalions were fighting in Burma. The 2nd Battalion was in 20th Indian Division and the 9th in 17th Indian Division. Both these Battalions fought many bitter actions in the siege of Imphal, and in the advance down to Burma to evict the Japanese. In North West Europe, 6 Border served as a Beach Landing Group on the Normandy Beaches in June and July 1944, before being disbanded and dispersed mainly to Battalions in 15th (Scottish) Division, who fought through to the end of the war. After the war, the Regiment was reduced to one Regular and one Territorial Battalion. The 1st Battalion of the Regiment were initially part of the Armies of Occupation in Germany and Italy. Trouble, however, was soon to break out in British Territories and Protectorates. 1 Border were sent to Palestine in 1947, and remained there until the evacuation in 1948. It then served in British and Italian Somaliland. It coped with the Somali riots in the capital Magadishu, before handing the Territory back to the Italians and returning home. They were only home a year,before they were in the Middle East again, this time in the Canal Zone of Egypt, where they remained until 1954. From 1955 to 1959, the Battalion was in Germany and Berlin. 1 King’s Own arrived in Korea in October 1953, and after a year moved to Hong Kong. In 1958, having returned home, it was sent to Kenya and Aden, until settling back in Barnard Castle in July 1959 where it and the Border Regiment finally met in Barnard Castle in September 1959. On 1st October they Amalgamated and two great Regiments became The King’s Own Royal Border Regiment, taking with them into the future the history and traditions of the 4th, 34th and 55th Regiments.